To all collectors of ceramic Mermaids, Seahorses and Fish, boy you are in for a real treat with this book by Arleen Smith – Ceramic Fish, Mermaids & Seahorses: Bathroom Decorations of the 1940s & 1950s. 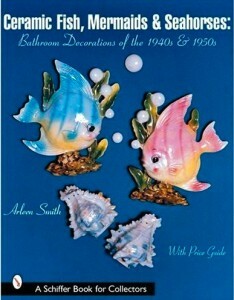 I have not come across another book like this one that particularly focuses on vintage 1940s – 1950s bathroom ceramics. 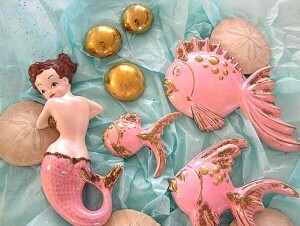 The author introduces you to the “Ceramic Potters” of yester-year like Bradley Exclusives, Josef Originals, Ceramicraft, Kay Finch, Deforest, Freeman-McFarlin, Lefton, Napco, PY, Enesco, Norcrest, Napco, Joty, Gilner, Holt Howard and the Made In Japan imports. The book was published by Schiffer back in 2001 but don’t for one moment think it is out-dated as it has 128 pages full of photos, information and values. OK, value wise the book is a touch out-dated but from researching these kitschy sea collectibles in today’s 2010 market, I can tell you that their value and appeal is skyrocketing! 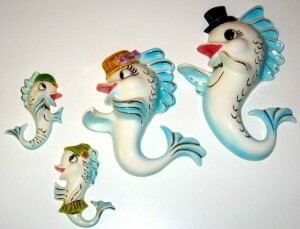 Ceramic Fish, Mermaids & Seahorses: Bathroom Decorations of the 1940s & 1950s shows the reader the many beautifully crafted Mermaids, Fish, and Seahorses complete with bubbles. You get to see the differences in the crafting styles of the many artists during the 1940s-1950s and also see the differences between the Japan made pieces. Yes, the Mermaids are beautiful Vixen Sirens of the sea and the Seahorses are a Magical Mystical creature some with rhinestone eyes and Fish made from chalkware to such highly detailed, painted and stylized pieces that you are left in awe! 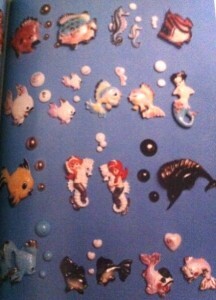 For details about this amazing book please visit HERE to get yours!